At the invitation of President Donald Tusk of the European Council, President Jean-Claude Juncker of the European Commission, and President Antonio Tajani of the European Parliament, Vice-chairman of the CPPCC National Committee and Minister of Science and Technology Wan Gang will attend the funeral held by the EU for former German Chancellor Helmut Kohl in Strasbourg, France on July 1, as the special envoy of President Xi Jinping. Mr. Kohl was an eminent statesman. President Xi Jinping said, in his message of condolences to German President Frank-Walter Steinmeier on the passing of Mr. Kohl, that Mr. Kohl had devoted himself to promoting China-Germany and China-EU dialogue and cooperation. He had made positive contribution to the development of China-Germany relations and had been understanding and supportive of the Chinese people's endeavor for complete national reunification. The Chinese people will never forget this old friend of them. 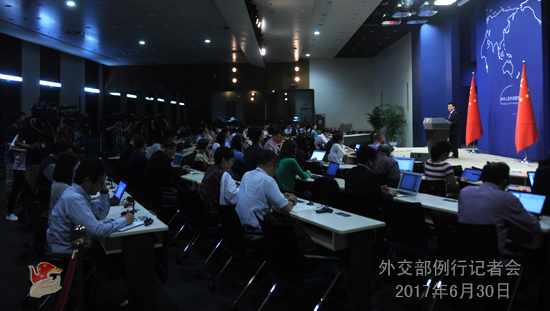 Q: The US has approved US$ 1.4 billion worth of arms sales to Taiwan, but has also emphasized that there is no change to its longstanding "one China" policy. What is China's comment on that? A: On June 30, the US government announced to sell US$ 1.4 billion worth of arms to Taiwan. The Chinese side lodged representations with the US side both in Beijing and in Washington. The Chinese side pointed out that Taiwan is an inalienable part of China. By selling arms to Taiwan, the US has severely violated international law, basic norms governing international relations and the three China-US joint communiqués, and jeopardized China's sovereignty and security interests. The Chinese side firmly opposes that. The Chinese side stressed that the Chinese government and people will never waver in their will and determination to defend national sovereignty and territorial integrity, and fend against external interference. We strongly urge the US side to honor its solemn commitments in the three China-US joint communiqués, cancel its arms sales plan, and stop its military contact with Taiwan, so as not to cause further damage to China-US relations and bilateral cooperation in major areas. A: We have been saying that the Chinese side opposes unilateral sanctions out of the UN Security Council framework, especially the "long-arm jurisdiction" over Chinese entities and individuals exercised by any country in accordance with its domestic laws. The Chinese side faithfully implements UN Security Council resolutions on the DPRK in their entirety, and fully observes its international obligations. Our efforts are for all to see. Chinese companies or individuals, once suspected of violating Security Council resolutions, will be investigated and treated in accordance with China's domestic laws and regulations. We strongly urge the US to immediately correct its mistake, so as not to impact bilateral cooperation on relevant issues. Q: British Foreign Secretary Boris Johnson said on June 29 that the rule of law, an independent judiciary and a free media have all been central to Hong Kong's success. Hong Kong's future success will depend on the rights and freedoms protected by the Sino-British Joint Declaration. The spokesperson of the US State Department also said that the US remains concerned about any infringements of civil liberties in Hong Kong, including intrusions on press freedoms, and supports the further development of Hong Kong's democratic systems. What is China's comment on that? A: We can tell whether Hong Kong is successful or not based on its development over the past two decades since its return to the motherland, rather than any outsiders' irresponsible remarks. The Hong Kong Special Administrative Region (SAR) has achieved all-round progress over the past 20 years under the energetic support of the central government and the mainland. From 1997 to 2016, GDP annual growth rate in Hong Kong averaged 3.2%, ranking among the top developed economies. Hong Kong has kept its unemployment rate below 3.5% over recent years, while the world average is 5%. For 23 years in a row, Hong Kong has been rated by the Heritage Foundation as the freest economy in its Index of Economic Freedom Report. According to the International Institute for Management Development (IMD) World Competitiveness Yearbook 2017, Hong Kong topped the list of competitive economies for the second consecutive year. The successful practice of "one country, two systems" in Hong Kong, prosperity and stability of Hong Kong, and the prosperous and contented life of people in Hong Kong have made people of the SAR and the entire China happy, although it seems to have made some others sour. As for the remarks made by those from the US and the UK, I want to stress that Hong Kong is China's SAR, and Hong Kong affairs belong to China's domestic affairs. The Sino-British Joint Declaration (1984) clearly marks the transitional period off from China resuming the exercise of sovereignty over Hong Kong. It's been 20 years now since Hong Kong's return to the motherland, and the arrangements during the transitional period prescribed in the Sino-British Joint Declaration are now history and of no practical significance, nor are they binding on the Chinese central government's administration of the Hong Kong SAR. The British side has no sovereignty, no power to rule and supervise Hong Kong after the handover. It is hoped that relevant people will come around to this. Q: Philippine Foreign Secretary Alan Peter Cayetano is on his first visit to China as a foreign secretary. What agreements have been reached by China and the Philippines on cooperation across the board? Can you elaborate on progress the two sides have made in practical cooperation since the turnaround in the bilateral relations? A: As you have said, Foreign Secretary Cayetano is in China for an official visit. State Councilor Yang Jiechi met with him the day before yesterday. Yesterday, State Councilor and Defence Minister Chang Wanquan met with him, and Foreign Minister Wang Yi had extended talks with him. Over the past two days, the two sides have had in-depth discussion on bilateral cooperation, China-ASEAN relations, and regional peace and stability, reaching important consensus. Premier Li Keqiang will soon meet with Foreign Secretary Cayetano. Regarding the outcomes of practical cooperation between China and the Philippines, over the past half a year or so since the China-Philippines relationship got back on track in October last year, bilateral cooperation has been developing in full swing, with 22 cooperation documents signed in infrastructure, trade, agriculture, anti-drug, tourism and other fields, and infrastructure projects such as railways, water dams and bridges taken as priorities. We have seen an uplift in bilateral trade since this year, with China becoming the largest trading partner of the Philippines for the first time, and the Philippines substantially increasing its exports to China. All these outcomes have brought tangible benefits to the two peoples, and proven that good-neighborly and friendly cooperation is the only right choice that serves the interests of both sides. Going forward, the Chinese side will continue to deepen practical cooperation with the Philippines. In the meantime, we welcome the Philippines' active participation and important role in developing the Belt and Road, so as to synergize development strategies of the two sides and push forward the bilateral relations. Q: Over the last few days, China-US relationship has gone from being quite positive since the meeting at Mar-a-lago to having more and more uncertainties because of the arms sales to Taiwan and the sanctions on Chinese companies due to the Korean nuclear issue. Next week, President Xi Jinping and President Donald Trump are going to meet at the G20 Hamburg Summit. Do you believe that we are in a new period of turmoil or instability in China-US relations? How will China deal with those new uncertainties? A: Consensus reached by leaders of China and the US at their Mar-a-lago meeting reflects the common interests of the two sides, and points in the right direction of China-US relations. On our part, we definitely hope to keep the momentum going and even build it up, however, as you have said, erroneous actions by the US over the recent period of time, its proposed arms sales to Taiwan in particular, run counter to the important consensus at the Mar-a-lago meeting, the overall trend of the China-US relationship, and the interests of the US itself. As I just said when answering the question about US arms sales, we hope that the US will correct mistakes, bring the bilateral relationship back to the track of sound, steady and sustained growth, and avoid negatively affecting bilateral cooperation in major areas. Q: Yesterday at the press conference, you presented pictures demonstrating Indian border troops' trespass. When and where were those pictures taken? A: Pictures posted on the Foreign Ministry's website were taken on June 18 when Indian border troops were spotted on the Chinese side of the boundary near Doka La pass at the Sikkim section. And for your information, we have attached one more map to the transcript of yesterday's press conference, for the purpose of giving you a clearer picture of what has happened. Q: You said that you hope the US side will change its course to avoid negatively affecting other areas of cooperation. Is the Chinese side contemplating any specific retaliatory measures and what specific areas could be negatively affected? 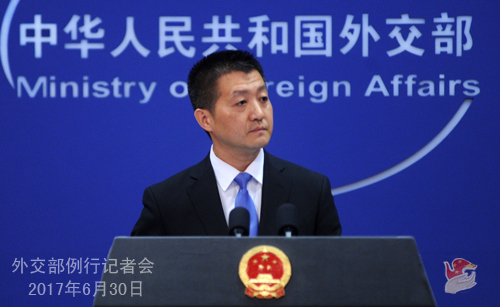 A: We have been stressing that a sound and steady China-US relationship serves the interests of both sides. Wrong actions taken by the US on the Taiwan question which bears on China's core interests go against the consensus reached by leaders of the two countries at Mar-a-lago. On an issue as important as this, wrong actions by the US will affect bilateral cooperation in major areas. We have lodged representations with the US about that in both Beijing and Washington, asking them to correct their mistakes. Follow-up: Did China protest both about the arms sales and about sanctions on China? A: By "sanctions on China", are you referring to the "long-arm jurisdiction" exercised by the US? (Journalist nodded) We have lodged solemn representations with the US about its wrong actions including the arms sales to Taiwan and the "long-arm jurisdiction". 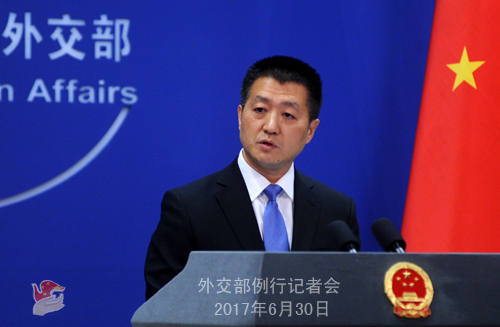 Q: Further to the protest lodged by Bhutan over the road construction by the PLA at the Sikkim section, the Bhutan Foreign Ministry also issued a statement, accusing China of violating the 1998 agreement on maintaining the tranquility of the border area pending the final settlement of the boundary dispute. What is your response to this? A: The Chinese side has stressed many times that it is an indisputable fact that Doklam is part of China's territory. The area where the construction activities are underway is totally under the jurisdiction of China because it is completely located on the Chinese side of the China-Bhutan traditional customary line. Therefore, there is no breach of agreement or damage to status quo. Since the Indian journalists repeatedly mentioned Bhutan when it comes to Doklam, in order to let you have a correct understanding of the fact, I'd like to spend some time elaborating on why Doklam belongs to China. First, in terms of history, Doklam has always been the traditional pasture for border inhabitants living in Yadong, Xi Zang. China has been exercising jurisdiction over this area. Before the 1960s, if border inhabitants of Bhutan wanted to herd in Doklam, they needed the consent of the Chinese side and had to pay the grass tax to China. Nowadays the Xi Zang Archives still retain some receipts of the grass tax. The Qing government's high commissioner in Xi Zang once erected a landmark on the China-Bhutan traditional customary line to the South of Doklam. Secondly, in terms of jurisprudence, the boundary convention signed in 1890 explicitly stipulates that Mount Gipmochi is the junction of China, India and Bhutan, and Doklam is situated on the Chinese side of the China-India and China-Bhutan boundaries. Thirdly, in terms of the ground situation, the Chinese side has complete jurisdiction over Doklam since every year the Chinese border troops patrol there and the herdsmen graze their livestock there, and a number of production and living facilities have been built there. Bhutan knows fairly well the aforementioned grounds and recognizes them all. Although China and Bhutan are yet to establish diplomatic ties, the two countries enjoy traditional friendly relations. They view their relations as a good example of countries, big and small, living on friendly terms with each other. Big as China is, it has never acted like a bully. The goodwill of the Chinese people towards the Bhutan people has not changed, but China's resolve in safeguarding its own territorial sovereignty is also unwavering. What has happened at the China-India boundary is rather clear. It was the Indian side who trespassed on the Chinese territory and obstructed China's normal construction. The pressing task now is for the Indian side to bring those who trespassed on the Chinese territory back to the Indian side of the boundary. Q: Today is the last day of Dr Margaret Chan's term of office as Director-General of the World Health Organization (WHO). What is China's comment on her job? A: Since Dr Margaret Chan assumed the post of WHO Director-General, she has taken up the responsibility of enabling everyone to enjoy a healthy life and fulfilled her duties as Director-General in the face of severe global health challenges. She has mobilized and coordinated efforts to tackle multiple major public health emergencies and done a great job in safeguarding people's health and safety around the world. Based on the blueprint mapped out by her and under her leadership, Dr. Margaret Chan has comprehensively promoted the reform of the WHO and made positive contributions to enhancing its global influence. She has been working for the development goals of the United Nations in the field of public health, for better health conditions in developing countries and for the improvement of global health governance. The Chinese side highly commends her important contributions to and universally acknowledged achievements in building a healthier world, addressing the human health challenges and safeguarding people's health and welfare. The Chinese side sets great store by the status and role of the WHO in global health affairs and values its cooperation with the WHO. During the tenure of Dr. Margaret Chan, cooperation between China and the WHO has been expanding and deepening. China will continue to support the work of the WHO and move forward its cooperation with the WHO. 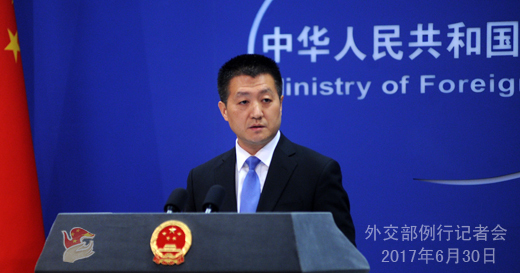 Q: Regarding the Sikkim standoff, previous statement by the Chinese Foreign Ministry was that talks were going on between both sides to resolve the issue. Are the talks on this issue still going on? A: I once mentioned that China and India keep an open line of diplomatic communication. The cause of the current situation is Indian border troops' illegal entry into the Chinese territory by crossing the defined boundary recognized by the Indian side. It is imperative that the Indian troops pull back to the Indian side of the boundary. That is the precondition for any meaningful dialogue between China and India. Q: You said that Diplomatic channels are open, at the same time, China insists that the Indian troops go back to their own positions. Are the talks about the withdrawal of the Indian troops? A: I think I have made myself clear, but I can say that again. The cause of the current situation is Indian border troops' violation of the two countries' consensus on the delimitation of the boundary and illegal entry into the Chinese territory. It is imperative that the Indian troops pull back to the Indian side of the boundary. That is the precondition for any meaningful dialogue between China and India.